It is common for practitioners to meditate on, make offerings to, chant Sūtras about, and recite the name or Mantra of a particular Buddha or Bodhisattva. These Mahāyāna expressions developed out of the daršana complex, which is well documented in the earliest materials, and were seen as part of the overall institutional fabric of Indian Mahāyāna. The core Mahāyāna idea is to cultivate a daršanic relationship with the Buddha and thus gain awakening, or one could aim at future birth in the Buddha-field. The genre of Mahāyāna literature that developed these ideas was instrumental in the formation of the Tantras. Amitābha Buddha and his accompanying Bodhisattvas, Avalokiteśvara and Mahāsthāmaprāpta, are the focus of the Pure Land tradition in East Asia. This society’s practice was based on the Pratyutpanna-Samādhi Sūtra. The lead devotee was Liu Yimin, one of the 18 sages of Mount Lu, who wrote the society’s manifesto and a collection of chants. The area became a center of Pure Land teachings. The Larger Sukhāvatī-vyūha -Sūtra, a major text in the tradition, had been translated twice by the mid- third century. In 402 the Amitābha Sūtra (also called the Amida Sūtra or Smaller Sukhāvatī-vyūha-sūtra) and later the Daśa-bhūmika-vibhāṣā (Treatise on the 10 Stages), attributed to Nāgārjuna (ca. 2nd century), were translated by Kumārajīva (350-409/413). The Guan Wuliangshou jing (Contemplation of the Buddha of Limitless Life Sūtra) is claimed by tradition to have been translated 424-453, though it is probably a Chinese or Central Asian composition. Once these 3 major Sūtras and one main commentary became available, the Pure Land teachings moved away from being solely based on the Pratyutpanna-Samādhi Sūtra. b) Lue lun anlejingtu yi (An Abridged Discourse on the Pure Land of Peace and Bliss). b) the Easy path (the Pure Land path). and he accepted the divisions of the dharmakāya into a dharma-nature aspect and an expedience aspect. Tan-luan coined the term other power, meaning not relying on one’s false notion of a self and its abilities but on the Nirvāṇa power of Amitābha, a refinement of the Mahāyāna concept of adhiṣṭhāna (base, power, approach, establish). According to Japanese sources, this constitutes a second transmission lineage. One of the greatest successors in Tan-luan’s line is Tao-ch’o (562-645), who, inspired by Tan-luan’s writings, wrote An Le Chi (A Collection of [Passages Concerning Birth in the Land of] Peace and Bliss), and promoted the idea of the Decline of the Dharma and the idea that the Nianfo Samādhi was the highest Samādhi. At first he studied on Mount Lu and achieved some success practicing according to the Pratyutpanna-Samādhi-Sūtra. He later became Tao-ch’o’s disciple and was able to attain the Nianfo Samādhi. he taught that nianfo was sufficient for rebirth in the Pure Land and that Amitābha was a Saṁbhogakāya Buddha. 3. Confidence that seeks rebirth. On the far side, Amitābha stands, indicating that we should come. His teachings emphasized meditation, study, recitation, and precepts. Zhiyi was a devotee of Amitābha (and other Buddhas). In addition, he worked on the problem of classifying the different types of Pure Lands and developed the Constant Walking Samādhi, which is focused on Amitābha, a core practice for Tiantai. Tiantai followers helped make Pure Land part of daily life during the Song dynasty (960-1279) and thereafter by forming White Lotus societies and engaging in other activities to spread the tradition. The Tiantai form influenced the 4th Chan patriarch Tao-hsin (580-651). Xuanshi, a disciple of the 5th patriarch, Hongren (688-761), founded the Southern Mountain Chan of the Nianfo Gate School. Baizhang Huaihai (749-814) incorporated Pure Land practices into his Chan rules, which are the behavioral code for Chan monasteries. Yanshou (904-975) was influenced by Cimin’s line. There were many significant figures in Chinese Buddhist history who, although masters of different teachings such as Huayan and Sanlun, were influential in the overall development of Pure Land thought and practice. In fact, Pure Land teachings became so ubiquitous in Chinese Buddhism that to speak of them as a school is a misnomer. Gyōki (668-749), while cultivating donations for the building of Tōdai-ji in Nara, spread the Pure Land teachings to the populace by publicly reciting the nenbutsu (Chinese, nianfo) and teaching people about the Pure Land in their homes. Chikō (709-780), a resident of Nara’s Gangō-ji, wrote a now lost commentary to Vasubandhu’s Discourse and had a Maṇḍala painted after his vision of the Pure Land. These were the major Pure Land activities during the early period. Saichō (767-822), the founder of Tendai (Chinese, Tiantai) in Japan, introduced the teachings on Amitābha associated with this line of transmission. Upon his return to Japan, he blended the “constant walking Samādhi” with the “5 movements” and created the non-stop (fudan) nenbutsu. He also seems to have known some esoteric aspects of Amitābha lore. With these beginnings Tendai became the fountainhead of Pure Land teachings in Japan for many centuries with masters like Ryōgen (912-985), Ryōnin (1072-1134), and many more. Of special distinction is the great master and prolific writer Genshin (942-1017), who composed some 20 works on Pure Land teachings, including the celebrated Essentials for Birth. The Heian period witnessed Amitābha sages who helped spread the teachings to the general population. Several of these are historically significant. Kūya (903-972), a Tendai monk, performed many good works and taught the nenbutsu in the Nagoya, Kyoto, and northern Japan. Senkan (918-983), Kūya’s disciple, wrote Sukhāvatī Realm Amida Chant and many other works. Kūya strictly observed the Precepts and established 8 rules and 10 vows for his disciples. In addition, masters associated with many other schools of Japanese Buddhism also practiced and promoted Pure Land teachings. The first major figure to address this effort as it related to Pure Land teachings was Hōnen (1133-1212), a learned Tendai priest. He wrote a commentary to Genshin’s work, which became the standard of interpretation. d) welcoming by Amitābha at the time of death. Hōnen’s writings generally accepted the interpretation of the Shan-tao line. He also transmitted the Bodhisattva precepts, and his teachings formed the basis of the Jōdo School. Like Hōnen, Shinran was first trained as a Tendai scholar-practitioner. He lived as an openly married priest and propagated Pure Land teachings near eastern Tokyo. He wrote a number of works including Teaching, Practice, Faith, and Attainment. Shinran considered Amitābha to be the Ādi Buddha, and he emphasizes “other power,” exclusive nenbutsu, crosswise transcendence (instant and gradual attainment of awakening with Pure Land birth), the disadvantages of the path of sages, and the advantages of the Pure Land path. 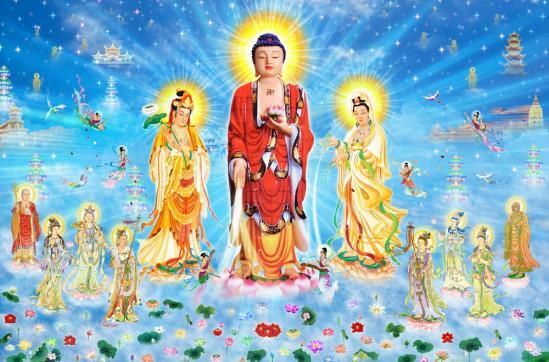 He also emphasized One Vehicle (the nenbutsu), the dharma ending age, and that “confidence” or “faith” is endowed by the Tathāgata, is Buddha-nature, and is the key to liberation. Ippen had an awakening while in retreat at Kumanojin-ji and afterward spread the “dancing nenbutsu” teaching, which expresses the joy of the liberating power of Amitābha. The Ji school is based on his teachings. Although Chinese and Japanese practices and interpretations have developed along different lines, taken as a whole they help form a rich fabric for the tapestry of the greater Pure Land tradition.